Mothers-to-be have a lot of important decisions to make, from choosing a name to deciding who will take care of the baby if – or when – they decide to go back to work. If you’re pregnant, one of the most important decisions you must make is to select a pediatrician for the crucial job of overseeing your child’s health care. The best time to start your pediatrician search is about 3 months before the baby’s due date. Babies can come early, so you want to have someone picked out well in advance of your baby’s ETA. At The Children’s Medical Group, our pediatricians not only allow but encourage new parents to schedule a prenatal visit. This lets you get acquainted with us, tour our offices, and ask questions about the birth of your baby and our practice. Our complementary prenatal visits are held Monday-Friday at all of our offices, plus Sunday afternoons in our Poughkeepsie office. Size matters. Will you be comfortable in a large group where you may see someone different each time you go? On the other hand, do you want to take the chance of not being seen immediately if you choose a single-person practice? Fortunately, with CMG, you don’t have to compromise. With nine offices across three counties in the Hudson Valley and 23 providers (and growing), you can find a location and personality that suits you perfectly. Each CMG office is set up as “your” Local Pediatrician, so you can count on seeing members of the same team each time you come to the office. But in the case of an emergency, you can be assured that you won’t have to wait. Timing is everything. Does the practice offer night or weekend hours if you need them? (We’ve got that! CMG offers convenient evening and weekend hours at several offices). It is important to talk to each of the doctors you’re considering, just as you’d interview a potential employee. We recommend that you take notes on all of the pediatricians you interview – and hold on to them after you’ve made your decision. Sometimes practices change, doctors retire, or things don’t work out the way you hoped, and it’s good to have a back-up plan. “What are the coverage arrangements for nights and weekends?” With evening and weekend hours for both well and sick visits, CMG allows working parents the convenience to juggle their busy schedules. There is always a doctor on call, 24 hours a day. “Do you accept my child’s medical insurance?” CMG accepts a variety of over 70 private and Medicaid insurance providers – just ask. “Will you be at the hospital after I deliver?” A CMG Pediatrician makes rounds at the hospital every day. Babies born at area hospitals other than Vassar Brothers are welcome to come to our office after the birth. “When should I schedule my baby’s first appointment?” Your baby should see the doctor within the 2-3 days of coming home from the hospital. At this visit you should expect the nurse and doctor to check the baby’s weight, height, and answer any questions you have. “What is your policy on taking and making phone calls/emails? Is there a number I can call to speak with a nurse or practitioner in case you aren’t available?” At CMG, the answer is always “yes!” Our physicians are available to discuss your child’s health, and you can always talk to a pediatric nurse or other knowledgeable practitioner. And our online Parent Resource Center provides extensive, clear and helpful answers to nearly all pediatric questions, 24/7. It can tell you what to do, what to watch out for and when to call – it’s like being able to talk to the doctor whenever you want. Our Patient Portal allows you to request prescription refills, schedule appointments and even view your child’s lab results and health records online, at your convenience. “If my child needs to see a specialist will you work with the specialist and coordinate his or her care?” Absolutely! We have dedicated staff to help you through that process. “Are lab tests done in your office? Or would you need to go elsewhere for basic lab procedures? If so, where?” CMG is a CLIA/COLA Certified & Accredited Moderately Complex Lab where we are able to accomplish 98% of all necessary Pediatric Labs in-house. For the remaining (rare) most-complex Lab tests we provide information where those lab tests can be accomplished locally. “When will my child ‘age out’ of your practice?” CMG offers expert care from birth through college – many of our practitioners excel at the specialized challenges of adolescent health. Did you feel that this doctor spent enough time speaking to you and showed a genuine interest in you and your child? Were you comfortable with the language he or she used and their ability to explain things to you in a way you would understand? Your life is about to change in a wonderful – and challenging – way. All the professionals at The Children’s Medical Group would like to help you navigate this passage. And if there’s one thing we know, it’s KIDS! If you are interested in meeting some of our providers please call any one of our offices… appointments are available daily! 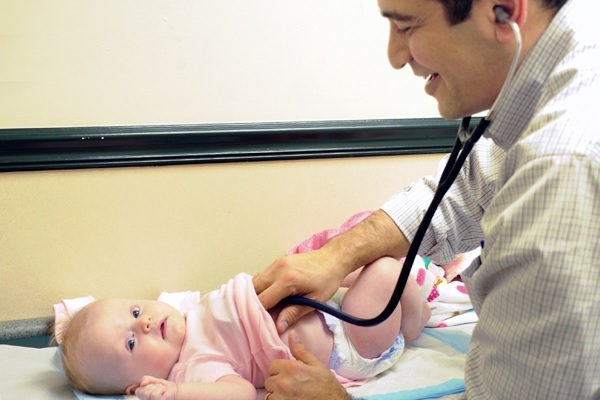 Click here for more information on choosing a pediatrician.